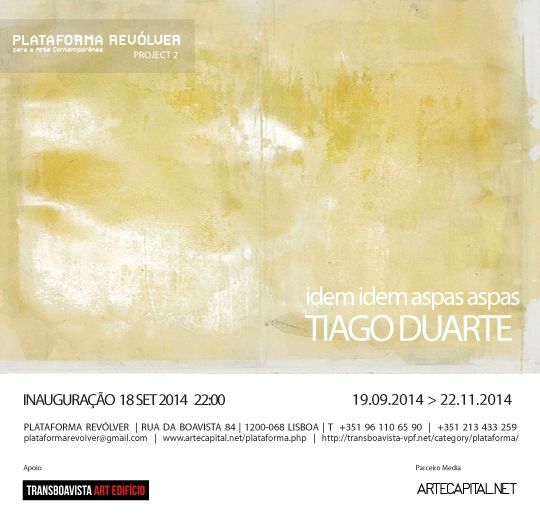 Para ’Idem Idem Aspas Aspas’, Tiago Duarte apresenta uma nova série de Monótipos sobre papel, realizada entre 2013 e 2014, que assenta nos formatos mais habituais da sua prática, assim como uma série de intervenções in situ que sublinham um diálogo em que o artista estabelece tangentes nas relações entre público, arte e espaço. Para além do corpo de trabalho apresentado de forma dita clássica, o artista fará uma série intervenções que pontuarão o espaço de forma transversal e transgressiva, (re)agindo e dialogando diretamente com as caraterísticas arquitectónicas e funcionais da Plataforma Revólver Project 2. 2014: Idem Idem Aspas Aspas, Plataforma Revólver. 2012: Dilue Noir, Celine Poisat, Paris. 2013: AA2A Artists in Residency Scheme Exhibition, UCLan, Preston; Contemporary Art Society, Not Just For Christmas, PS Mirabel, Manchester, UK; Dive In, Plataforma Revólver; Occupy, Manchester; Some Recent Examples, Lever Street, Manchester; Through, Gallery 22, Bolton; One Two, Bankley Gallery, Manchester. 2012: Cabedal, Plataforma Revólver; Meanwhile See This, Castlefield Gallery, Manchester; 60 Drawings, Bankley Gallery, Manchester; We Are All in This Together, Bureau Gallery, Manchester; Part of the Program, FaFa Gallery, Helsinki. 2011: MA Show, Holden Gallery, Manchester; Afternoon Tea, WW Gallery, 54th Venice Biennale, Venice, Italy; Secs and Death Cells, The Hive, Manchester; How to Howl, L’apparemment, Paris. 2010: Print Biennial, Royal Birmingham Society of Artists, Birmingham; Work, The Hive, Manchester; Parlance, L’apparemment, Paris. 2007: Lisbon Revisited, Phoenix Gallery, Edinburgh. 2005: Untitled, 369 Phoenix Gallery, Edinburgh. 2012/13: AA2A, University of Central Lancashire. 2013: Short-listed Beers Contemporary Award for Emerging Art, London. 2013: The Arts Foundation Fellowship, Printmaking category nomination, Hove. 2012: Ken Bromley Award, Neo:Artprize, Bolton. 2011: Axis Choice, online resource for contemporary art. 2010: London International Creative Competition, Winner, London; Open Art Competition, Pallant House Gallery, First prize, Chichester.